Contact us today to set up your audition time for membership in the 2018-19 season. Featuring members of the CCOC with a mixed chamber orchestra of Chinese and Western instruments. Since 1968, the CCOC has commissioned no less than 12 major operatic works and the Youth Chorus of the CCOC (for older choristers and changed male voices) will present one of the first, Chip and His Dog, by the prominent international composer Gian Carlo Menotti. In the late seventies, the company’s founder, Ruby Mercer, commissioned her friend to compose the work. It was premiered at the Guelph Spring Festival in 1979 and has gone on to countless international productions in numerous languages. The CCOC is excited to be bringing this opera home again. TORONTO – The Canadian Children’s Opera Company presents the thrilling lineup of its 2016/2017 50th Anniversary Season. Founded by Ruby Mercer and Lloyd Bradshaw in 1968 to provide the children’s chorus for the Canadian Opera Company, the CCOC has gone on to become an internationally-recognized organization in the field of children’s opera. On October 26, 2017, the CCOC will kick of its momentous 50th anniversary celebrations with a celebratory concert at Canada’s foremost opera house, the Four Seasons Centre for the Performing Arts. The company has shared the stage with countless opera stars over the years and we are happy to invite some of the best Canada has to offer to share the occasion. Internationally renowned tenor and radio personality Ben Heppner will host, with performances by Richard Margison, Krisztina Szabó, Simone Osborne and Andrew Haji. CCOC Music Director Teri Dunn will conduct the choruses of the CCOC while former music and artistic directors John Tuttle and Ann Cooper Gay will lead a chorus of the company’s many alumni. The event, one of the largest in the CCOC’s history, is generously supported by our partners at BMO Financial Group, Donnelley Financial Solutions, and the Canadian Opera Company. On November 26th, the CCOC presents its annual winter choral concert, presenting all six divisions of the company performing operatic and choral music. The Principal and Youth Choruses were featured in the concert and national TV broadcast benefitting food banks across the country. 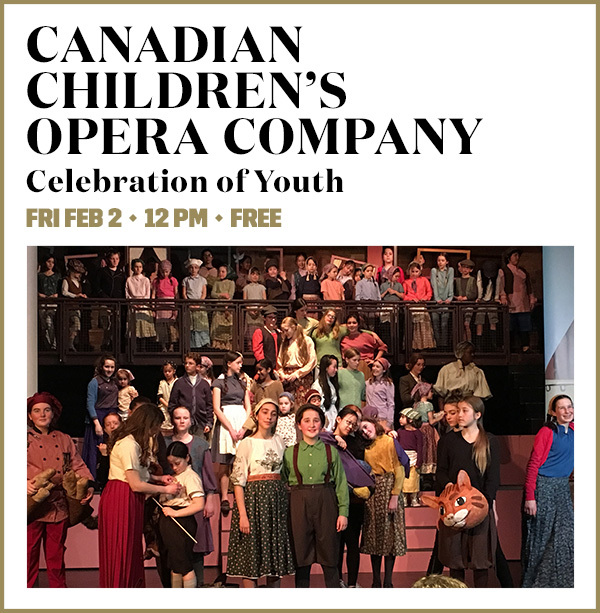 The community is invited to enjoy an hour of beautiful music performed by the Canadian Children’s Opera Company and spotlighting Roy Thomson Hall’s magnificent Gabriel Kney pipe organ. Celebrating its 50th season, the Canadian Children’s Opera Company is the only permanent children’s opera company in Canada that regularly commissions and produces opera for children. Based in Toronto, the members frequently perform with the Canadian Opera Company and other arts groups as well as tour nationally and internationally. This concert features the 80 choristers of the company’s Principal and Youth choruses. Part of Roy Thomson Hall’s 21st Annual FREE Noon Hour Choir & Organ Concerts. Made possible by the generous support of Edwards Charitable Foundation. In the spring, The Junior Divisions (children aged 3-10) will be presenting The Piper of Hamelin, featuring the children's opera by John Rutter with staging by Autumn Smith, and rounded out by a selection of choral works celebrating myths and monsters from around the world. Check out our previous seasons!